This striking artwork for Star Wars Episode 4: A New Hope by British artist Tom Chantrell became an instant hit with fans when it made the scene in late 1977. Chantrell was known for using family and friends to pose for his movie posters. 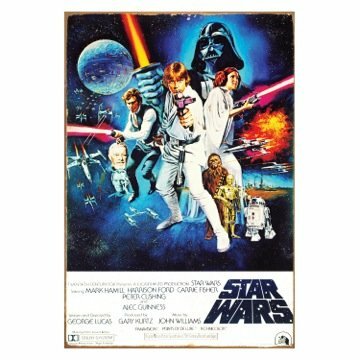 His wife Shirley held a plastic sword in their back yard to pose for Princess Leia in this original Star Wars movie poster art. Tin Totes are hot, hot, hot! For everyday use or as a collector item, these sturdy boxes have great storage space and fan favorite designs. In the world of licensed merchandise quality is every bit as important as price. Vandor can provide both with thousands of great items that speak to fans of all ages.